Lionel Raynaud, Executive VP of Creative for Ubisoft’s Canadian studios, was interviewed by the official Ubisoft blog after a recent pre-E3 corporate event. We’ve highlighted Raynaud’s mention of a storytelling shift across Ubisoft games, particularly geared towards having multiple arcs in the narrative as well as introducing elements such as romances and friendships with NPCs. What drove this is the will to not give finite experiences. The idea was that you have this conflict, and the resolution, and then it’s finished – you’ve killed the bad guy, for instance. We build a strong nemesis, and the goal of the game is to kill him or free the country, we’ve done that a few times in our games. But when you succeed, you have to leave the game, because there is nothing else to do. So the goal was to break this, and say that you will be the hero of a region or population many times, not just once. And if you get rid of a dictator or an oppressor, something else is going to happen in the world, and you will have a new goal. This is why I talk about having several fantasies; not only being the hero who’s going to free a region, but maybe also the fantasy of having an economic impact, of being the best at business in this freed country, or even having a say in how it should be governed, now that you’ve gotten rid of the dictator. And I think we can have several different experiences with different game systems in the same world if the world is rich enough and the systems are robust enough. The other way to see it is, especially when we create a world with the possibility of many different stories, is to have very different tastes of stories, depending on the characters. If we have 500 characters in the game we create, we can decide which sections of characters will appeal to a certain audience. There were questions about romance [during the corporate event], and it’s very obvious that there is an audience that is waiting for this. And some of our games are really ready to offer not only gunplay and fights, but romance, or friendship, or a ton of other things that would be super-interesting – and make the characters become more interesting and lovable because they don’t speak only about fights, but also about things that players live in their own lives. 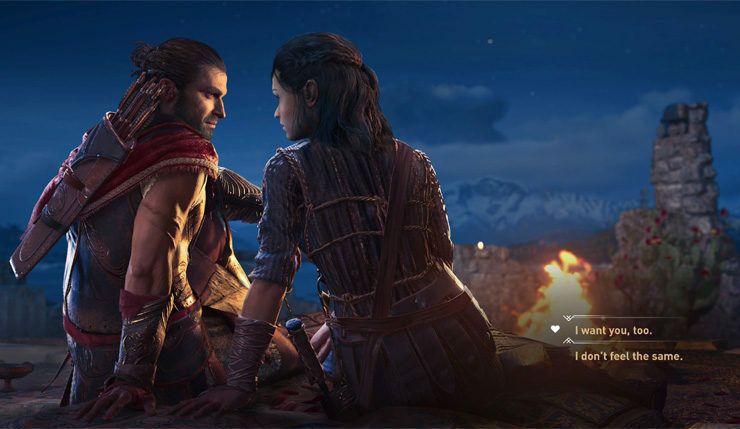 Romances will debut in Assassin’s Creed Odyssey, for instance, where players will have many NPCs available for romance. The game is out on October 5th for PC, PlayStation 4 and Xbox One.